Hey, my last entry was titled as according to this not so writing challenge. 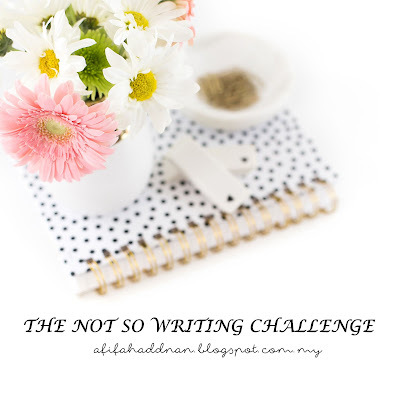 It is not really a writing challenge since the questions were meant to be answered quickly, not into an essay. But somehow, I kinda like the idea into making some of the questions into a full entry of my blog. The questions are meant to prompt the reader to question their current life stance. It was suppose to be this meditation thingy which you can read more here but for my sake, just treat it as some sort of writing prompt. 1. What are the things that stand between you and complete happiness? 2. What will people say at your funeral? 3. Standing at the gates of heaven, and God asks you “Why should I let you in?” What do you reply? 4. If you lost everything tomorrow, whose arms would you run into to make everything ok? 5. Does this person know how much they mean to you? When was the last time you told them? 6. If you could send a message to the entire world, what would you say in 30 seconds? 7. If you received enough money to never need to work again, what would you spend your time doing? 8. If today was the last day of your life, what would you want to do? 9. What would you change about your life if you knew you would never die? 10. If your entire life was a movie, what title would best fit? 11. How would you describe yourself in 5 words? 12. What are the chances you’ve passed up on that you regret? 13. How do you apply the learning from this regret to your actions today? 14. What would you do differently if you knew that no one was judging you? 15. If you could watch everything that happened in your life until now, would you enjoy it? 16. If you could ask a single person one question, and they had to answer truthfully, who and what would you ask? 17. If you could start over, what would you do differently? 18. When you’re 90 years old, what will matter most to you in the world? 19. Are you holding onto something that you need to let go of? What’s stopping you? 20. Would you break the law to save a loved one? 21. Do you ask enough questions, or are you happily settling for what you know already? 22. How do you celebrate the things you do have in your life? 23. When it’s all said and done, will you have said more than you have done? 24. When was the last time you tried something new? 25. What were you doing when you last lost track of the time? 26. What is the difference between living and existing? 27. If you had a friend that you spoke to the same way you speak to yourself, how long do you think that person would allow you to be your friend? 28. If you had to teach someone one thing, what would you teach? 29. What makes you smile? 30. What drives you to do better at something? 31. What do you really love to do? Do you do it often? If you answer no, why not? 32. What can you do today that you couldn’t do a year ago? What will you be able to do at this time next year? 33. What is the last thing that you’ve done that’s really worth remembering? 34. What gets you excited and driven to achieve? 35. When was the last time you travelled somewhere new? 36. What do you want most out of life? 37. If karma was coming back to you, would it help or hurt you? 38. If you could go back in time, once, and change a single thing – what would it be? 39. If you had a year left to live, what would you achieve over the next 12 months? 40. If you could ask for one wish, what would it be? 41. What do you “owe” yourself? 42. When you think of your home, what immediately comes to mind? 43. How do you spend the majority of your free time? Why? 44. What did you want to be when you were a kid? 45. What have you done to pursue your dreams lately? How about today? 46. What terrifies you the most? 47. What are you looking forward to? 49. Where would you like to live? Why haven’t you moved? 50. What have you done that you’re most proud to have achieved? 51. If you dropped everything to pursue your dreams, what would you be risking? 52. What is your greatest strength? 53. What is your greatest weakness? 54. What did your life teach you yesterday? 55. What have you done today to make someone’s life better? 56. Whose life have you had the greatest impact on? 57. What makes you special? 58. How many people do you truly love? What are you doing for them? 59. What bad habits do you want to break? 60. When did you not speak up, when you know you really should have? 62. If you spend a day watching movies when you should be working a day wasted or well spent? 63. Would your life be better or worse, if you knew the time and place where you would die? 65. Would you be a martyr and risk your reputation by standing up for what is right in front of your peers? Or is it better to be pragmatic and do nothing? 67. What would happen if you never wasted another minute of your life, what would that look like? 68. Would you rather have 10 years of excellent health, or 30 years of average health? 69. Is being open-minded a virtue, if it’s causing destructive ideas to spread throughout society? 70. Do you consider yourself the hero or the villain in your story? 71. How much control do you really have over yourself? 72. When did you last push the boundaries of your comfort zone? 73. What have you given up on? 74. Who are you really? Describe yourself without using your name, or any attributes given to you by society and really think. Deep down, who are you? p/s: I have reached 80k! i'll be sure to check them out! Roll On: I am all bad things. Roll On: What do I owe to myself. Roll On: 2017 Bloglist SA-VIORS. Roll On: Weekend Mind-Expanding Movies To Watch.